Spicy Tuna Kebab / Tuna Kabab is very easy and handy recipe. You can use less or more spices in this recipe. Just use your imagination and enjoy the flavour of spice. 1. Fry the onion till it becomes golden brown and keep aside. 2. Fry the dry chillies and crush it and keep aside. 3. Open tuna can and drain all liquid. 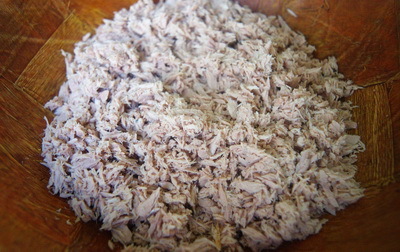 Make tuna shredded to use your finger. 4. Add chilli crush, fried onion, ginger, chat masala, 2 eggs, cornflour, mint leaves, black pepper and salt. Mix well and make 18-20 flat balls. 5. Break the last egg and whisk it. Deep each flat ball in egg batter and roll in bread crumbs. 6. Heat oil for deep fry and fry spicy tuna kebab / tuna kabab till it become golden brown. 7. 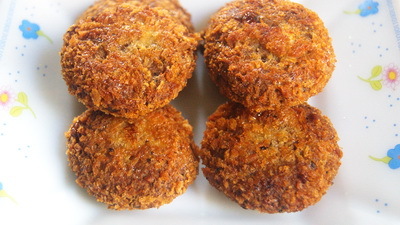 Serve spicy tuna kebab / tuna kabab as snack or along with rice. 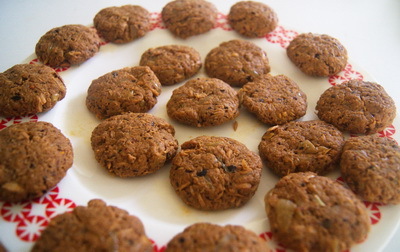 Tips: To make spicy tuna kebab / tuna kabab you can freeze it. When you need spicy tuna kebab / tuna kabab, take out from freezer and defrost it. Fry it till it becomes golden brown. First time roast search diye Bangladeshi roast recipe pelam ei site e -thank you for your effort. Keep it up! Is this 1 tablespoon or teaspoon chat masala? Thanks. Please post some bhorta and vegitable recipes. Most welcome. I will try to post bhorta and vege recipes soon..keep on eyes. I have tried this receipe and it was super hit .Awesome Rownak. I was woundering what chat masala is? And how do i make the powder? Isit possible? Very important question. If you live in Bangladesh , our very own chotpoti mosla is the chat masala. You can certainly make it with mixture of chilli powder, cumin seeds,coriander seeds, fennel seeds, raw mango/ amchur powder, black salt, black pepper, hing/ asafetida powder, ginger powder, dried mint(optional), ajwain/ carom seeds. I made ages ago, cant really remember the amount of it. But if you really want the recipe. I will make it. Please let me know. Thanks. can u pls tell me cashwa nut salad receipi?